I am setting up a confirmation email script for our customers to receive an email when they complete the online form. I uploaded my script and tested but I received an email with just the raw HTML. I have been looking at some tutorials trying to do this as well. I validated my HTML and I passed all the tests. Is there something that I have to include in my PHP for my body string to be interpreted as HTML? You need to also set a header indicating this is HTML, e.g. Not the answer you're looking for? Browse other questions tagged php html email outlook or ask your own question. 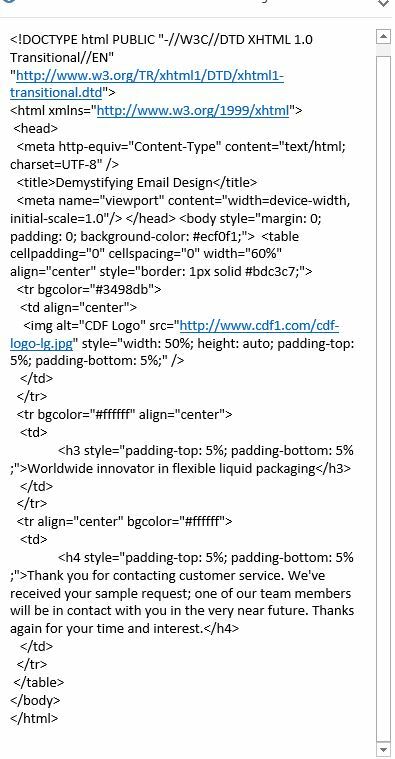 Where is the HTML5 Document Type Definition?